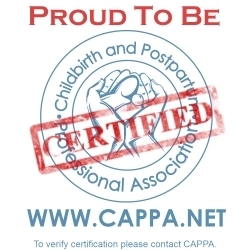 "CAPPA is an international certification organization for Doulas, Childbirth Educators and Lactation Educators. Since our foundation in 1998, we have certified thousands of perinatal professionals. As one of the first and most comprehensive perinatal organizations in the world, CAPPA is respected for its longevity and its commitment to excellence in both education and unsurpassed student and member support." Attend a CAPPA Postpartum Doula training class. Read the CAPPA Postpartum Doula training manual and 10 of the required books from the CAPPA required reading list. Read, and complete all online content, including videos, from the Understanding Breastfeeding Book. Current infant and child CPR certification through the American Heart Association or the Red Cross. Submit three evaluations from postpartum doula clients. Two letters of recommendation from professionals. Create a resource list with information on local support for parents. Sign and agree to the following forms: Code of Conduct and Social Media Policy, Grievance Policy, Mission Statement, CAPPA Approach / Philosophy Statement, Vision Statement, and Scope of Practice. Complete the Scope of Practice Intensive Review and pass the Scope of Practice Quiz.